Cold process soaps come with many benefits. It retains of the qualities of the ingredients much better as there is no heat to break down the ingredients. These creates soaps with better feeling and scents, which is also beneficial to your skin. Today’s recipe will be for a Teh Tarik inspired cold process soap. We start by Adding almond oil and distilled water to an oil mix. The oil mix is a combination of coconut, castor, palm and olive oil and has many benefits. For example, coconut oil is a great moisturizer and has anti-inflammatory properties which reduces redness of the skin. Almond oil keeps your skin healthy and unclogs the pores. 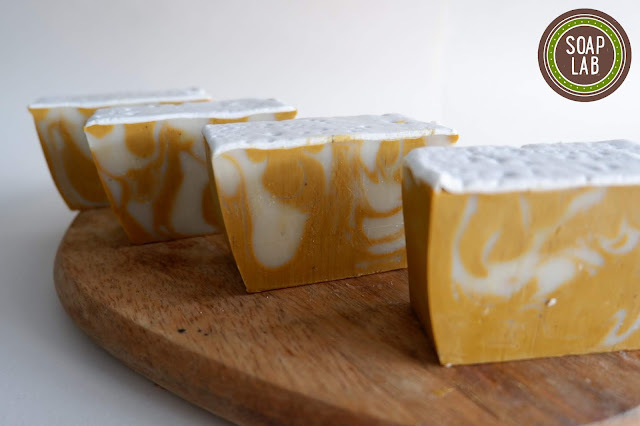 To read more about benefit of oils in cold process soap click here. For an aromatic scent, add Cafe Caramel and Dark Musk Fragrance Oil. Add in Dark Musk Fragrance Oil into the mixing container. Next, add in Cafe Caramel Fragrance Oil. Mix to combine the 2 oils into the mixture. In one of the container, Add in Yellow Iron Oxide that has been diluted with 10g of Almond Oil and mix. Spray mold with rubbing alcohol. Pour 1/4th of the mixture into the mold. At a height, pour 1/4th the soap mixture from the other container. Swirl & move as you go. Repeat steps 12 & 13, alternating between the 2 mixtures until mold is full. Set soap aside to allow it so harden slightly. For the froth, combine SoapLab’s Coconut Liquid Soap Base with SoapLab’s Transparent Soap Base that has been melted. Stick blend the mixture until it is light & frothy. Once there, transfer mixture into a disposable piping bag. Snip off the end of the piping bag with a pair of scissors and pipe the froth on top of the soap like so. Leave soap to harden for 24 hours. Using a soap cutter or a kitchen knife, cut soap according to desired size.